Our teachers are Mrs. Orledge and Mrs. Page. We look forward to sharing lots of photos of our learning with you over the coming months. Year 4 have been using the BBC 'ownit ' materials to check out their digital footprints and to think about staying safe online. We created a human numberline to show which fractions and decimals are worth the same. 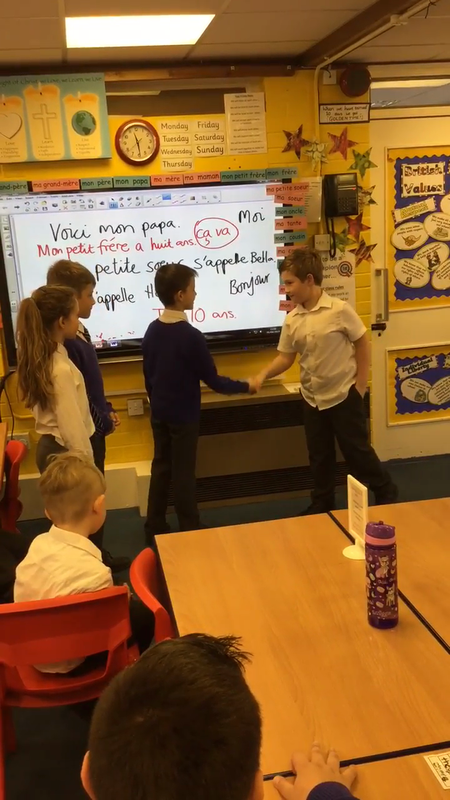 We created our own little French conversations to introduce ourselves to new people. We've been creating dramas in French where we introduce family members to a new friend. We were given the hypothesis 'Most cars that pass the school are silver.' We worked in groups to decide how to prove or disprove this. We collected our own data and presented our findings back to the class. We made Roman numerals out of cubes, we had to work out how to predict how many cubes would be in the 50th number without making it! Today we worked on problems with many possible answers, we tried to get them all!! Again we had a Roman theme! We worked together to fill in the grid using the clues that we were given. During maths problem solving week we have been working on Roman themed logic problems. Today the Lampedusa Cross visited our school. In year 4 we thought about some important questions. The first one was 'Where is God in our World today?' We decided that God is within us, showing us those in need, the word of God in the Bible advises us how to help. Our second question was, 'How do we hear God's voice?' We know that a part of God is in all of us, if we listen to our hearts and look into the hearts of others we can see where God needs us to act. This is us hearing the voice of God just like the people of Lampedusa did. Finally we thought about how our lives would change if we listened to God. We decided that if we all helped and supported others as Jesus did the world would become a happier and more peaceful place for everyone. This is what the people of Lampedusa were trying to achieve. We can all try to do our little bit to make the world better. We walked around the playground with the cross to help us to 'walk in the shoes of others'. We shared prayers, songs and moments of reflection on our journey. We created our own cross to mark the day. Our cross has all of our faces on it, it symbolises that we are all part of God and that a little piece of God is in each of us. On World Book Day we took the theme of 'Bedtime Stories'. Each class took at story to explore, ours was Tom's Midnight Garden by Phillipa Pearce. We used Talk 4 Writing to plan a letter from Tom to his brother Peter, here we are working hard (in our PJs!) writing up the first draft of our letters. Still in our PJs - just like Tom from the story - we sketched pictures of Mill House and it's gardens. Phillipa Pearce based the book on this house. We shared our favourite stories with children in year two and they shared theirs with us. Mr. Coggins (AKA Lucius) visited us from the Ermine Street Guard. He told us all about a Roman Soldier's life during our WOW day, we even got to explore his weapons and wear his helmet! Here are some of our completed Roman Shields - we used them to practise battle tactics on our WOW day! 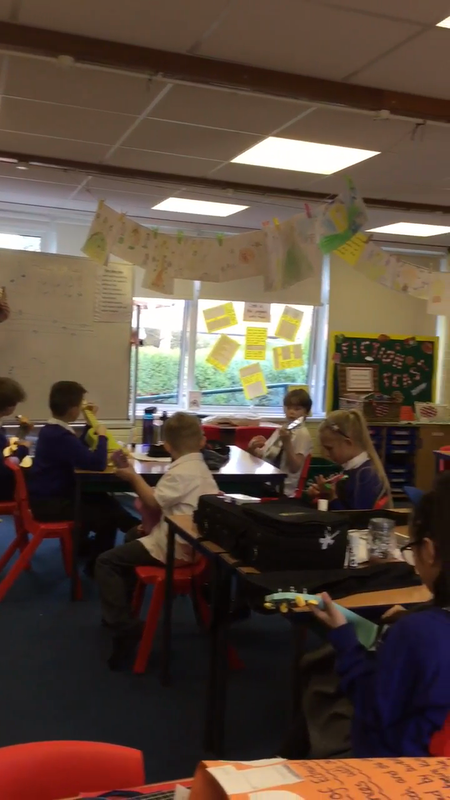 We have quickly learnt some chords to play along with songs. Playing our favourite, some on the melody and others accompanying! We are all a part of God and he is a part of us! We have been exploring ways in which we can represent different fractions. Here are some of the images of the Transfiguration that we created. 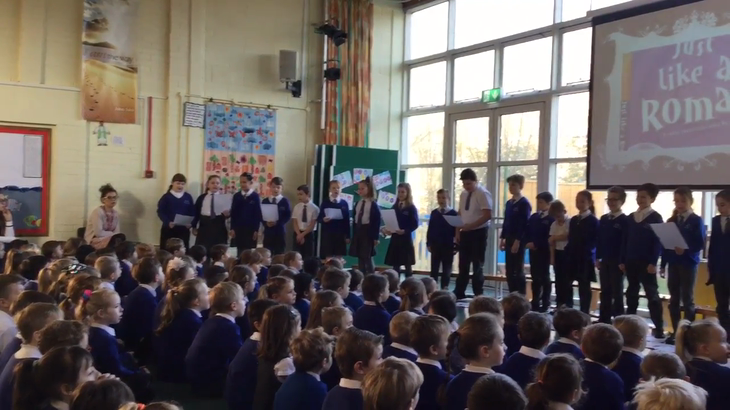 For those of you not lucky enough to see our assembly here is a clip of the class performing 'Just like a Roman' by Suzy Davies - enjoy!!! We have been studying the story Le Trois Bouc in French. We have learnt so many words that we had a go at acting it out in French! Here are some examples of the amazing work year 4 has been doing in RE. We have been discovering how the words of the Bible and the teachings of the Pope can affect how we see others around us. This term our topic is Romans - we have been making these fabulous Roman shields! We were inspired by Georgia O'Keeffe to create these beautiful poppies for remembrance. We made our own wreath to thank the service personnel who have given their lives so that we might live in freedom. We laid it on the War Memorial. We had lots of fun learning about World War 1 on our WOW day. Sid time travelled from WW2 to tell us about his time in WW1. We visited the Royal British Legion to see the giant memorial poppy and speak to ex soldiers about Remembrance. We've been working together as Secret Agents, solving one and two step problems to crack a code! Here we are putting the Stone Henge silhouettes on our backgrounds. We have been exploring colour while painting our backdrops for Stone Henge - look out for the finished artwork soon!! Today we have been exploring the 'Newspaper Report' as a genre. We have been building models of Stone Age homes with Miss. Cooper. In RE we've been working together to think about how we can all be stewards of God's Earth. The leaves on our tree are our promises to God. We have been designing Stone Age people in art. 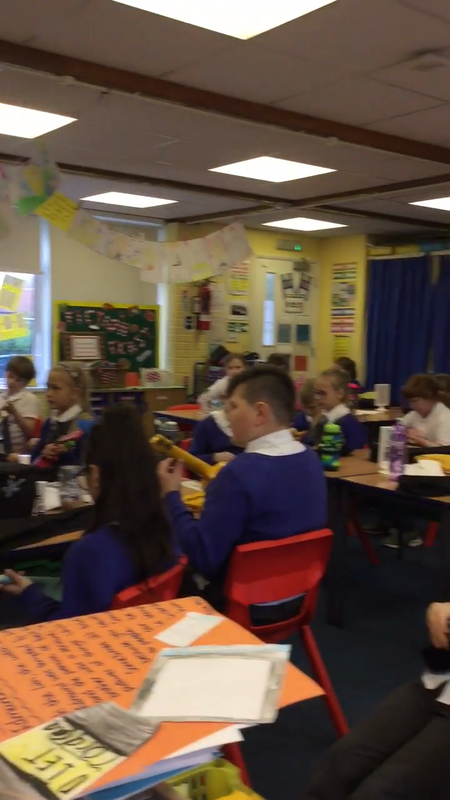 House of Lords debate Year 4's work was used to inform a House of Lords debate - click to hear it. This website has some interesting games to help you think about E-Safety. 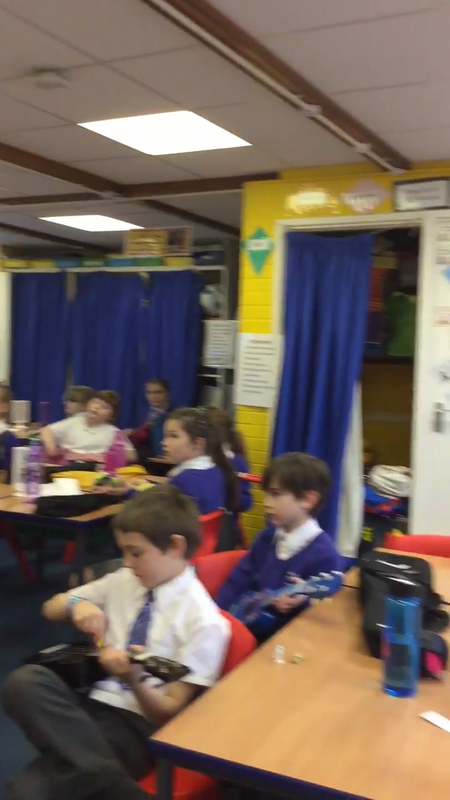 Listen to this E-safety song to help you think about how you share online! IXL maths We use this website to support our home learning in Year 4. Squeebles Mrs. Orledge recommends this app for learning tables and other maths facts! Multiplication.com Practise your tables skills here. The Learning pit - we are exploring why it's good to have challenges!